The camp director just posted a picture of a couple of counselors dancing to the song YMCA. The picture was taken at the end of a very rewarding but tiring week at the Camp Quest Arizona 2014. This was the second year for the camp and 49 enthusiastic campers (49 varying from age 8 through 17) attended. The challenge here, on this blog, will be to capture the spirit (that’s right fellow Atheists I said “spirit”) of the experience in a short blog entry. It was a great experience and there were many second timers. The staff was an eclectic collection of adults—from young to old(er) and the second year for many of them also. Half were “program staff” and the others were “cabin staff.” The program staff is responsible for the camp programs and the cabin staff is with the campers most of the time. As a program staff person, I was responsible for an elective event and a couple of Quest Zone activities. Everyone was a volunteer and everyone was busy providing a secular camp experience. Camp Quest is much like any other week long, sleep away summer camp. We borrowed a 4H camp that is part of the University of Arizona. We had traditional camp activities such as fishing, archery, orienteering, and nature hikes along with the secular and scientific specific activities such as Socrate’s Café where the campers get a chance to discuss deeper philosophical subjects. The cabins are separated by age and gender. Program staff members stay in the cabins also to help the cabin staff and fill in when necessary. There are week-long activities and some that only last an hour or so. Some activities are specific to the cabins. The campers are all members of teams that vary in age and gender. Most events are team events. However, there are a few activities that are elective and chosen individually by the campers according to their specific interests. I’ll say that there were plenty of “free time” opportunities but I’ll bet that most of the campers would say they could use more! The volunteers bring their own experience and interests and are responsible for the selection of some of the more unique activities. For example, I brought in activities associated with model aircraft, leather work, and (believe it or not) Karaoke. Speaking of unique opportunities, many of the campers made monsters out of stuffed animals. All 49 campers built a small wooden memory box. The pieces were pre-cut and when assembled the box was about 6″ by 9″ and 5″ tall with a lid and a bottom made out of plywood. There was a lot of work that went into the kitting of these boxes. Holes were predrilled and countersunk. All the hardware was available but there was a lot left to do by the campers. There were several hammers and three electric drills for the campers to use to drive the screws that held the main frame of the box together and attaching the two hinges. But the best part of the memory box activity was that once the boxes were complete and placed in their proper order, they revealed a special picture with meaning for science based campers…Ta Dah! There is no way to completely desc ribe Camp Quest AZ 2014 but I’m glad to have been a part of it and hope to be a part of it again next year. 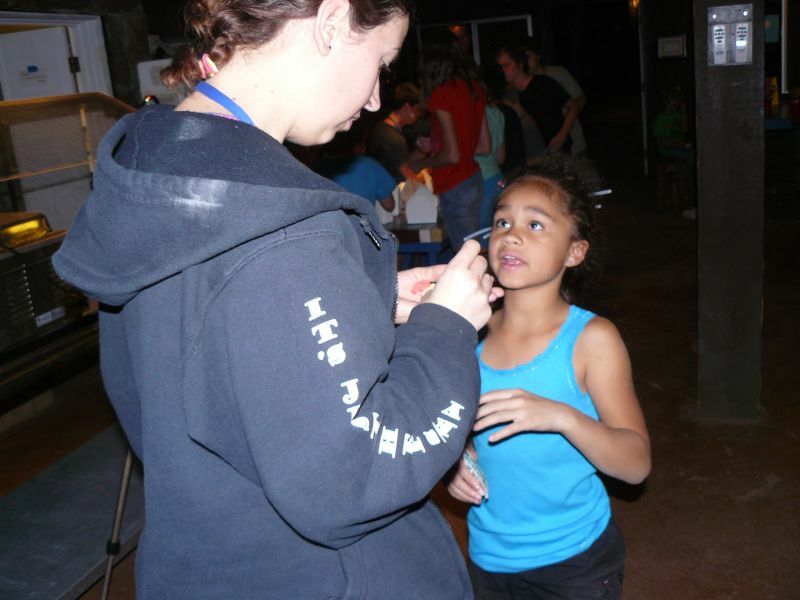 Camp Quest is now a feature of the Secular Community of Arizona and we owe a great deal of thanks to the volunteers that made it happen for the second time! Thank you John, Eugene, Chuwan, Jennifer, and Holly for all the hard work and making it happen again in Arizona! I forgot to mention a very important member of the camp staff–the very awesome camp nurse. Nell was on duty 24 hours a day and cared for every scrape and illness (there were a few but not many). She also made sure that all campers took their medication. This entry was posted in American Atheists, Atheist Action, Religion, Skepticism and tagged Arizona, Atheist, community, event announcement, freethought arizona, Humanism, inquiry, Logic, Science, Skeptic, Tucson Atheists. Bookmark the permalink. Looks like a ton of fun. Great pictures and story! Thank you Donald, I’m proud to reblog this post. Helping educate the next generation, in a fun environment like this, is very important! My daughter enjoyed her second year very much. Nice summary, thanks. My daughter had a blast (she didn’t want to leave). Thank you for the write up! She took to it like a duck to water! It was a pleasure to have her at camp for the week. You forgot to mention the very awesome camp nurse! 🙂 I had such a great time. What an amazing group of kids and volunteers. It was a pleasure meeting you at camp Don. Nell! Darn I didn’t mention the awesome camp nurse. I’m going to fix that. It was a pleasure to meet you too. Our kids one again had an awesome time at Camp Quest. Thanks to all who helped put it on!